Plastic Surgery is an important personal decision and event in your life. Enhancing and improving your natural assets is the objective of plastic surgery, so procedures are designed specifically around your needs and desires, keeping in mind what is appropriate for you. Our goal is to fully understand the results you wish to obtain and to communicate to you what can be achieved through the latest plastic surgery techniques and procedures being performed today. Investing time and effort in building a strong, trusting doctor-patient relationship, one that allows the patient to ask the right questions to make informed, careful decisions, is the best way to ensure that you are happy with your results. At Dr. Mabourakh’s practice, we recognize that plastic surgery is an important personal decision and event in your life. The entire staff at Dr. Mabourakh’s office is dedicated to the highest standard of care and results, while maintaining your privacy and confidentiality and treating you, our patient, with the utmost professionalism and respect. Ensuring good communication between you and Dr. Mabourakh is our primary concern when planning your surgery. In your initial consultation, you’ll be asked to explain in detail why you are contemplating plastic surgery and how you hope to look and feel afterward. It is important to set aside any awkwardness you might feel, and speak candidly about the changes you would like to see with Dr. Mabourakh. You should feel completely assured that you and Dr. Mabourakh understand one another. Why is it important to go with a board certified surgeon? A good sign of a surgeon’s competence is certification by a surgical board that is approved by the american board of medical specialties. When you choose a surgeon who is board certified in a surgical specialty, you are assured that he or she has completed years of residency training in his specialty and has demonstrated his knowledge and competence by successfully completing a rigorous examination. 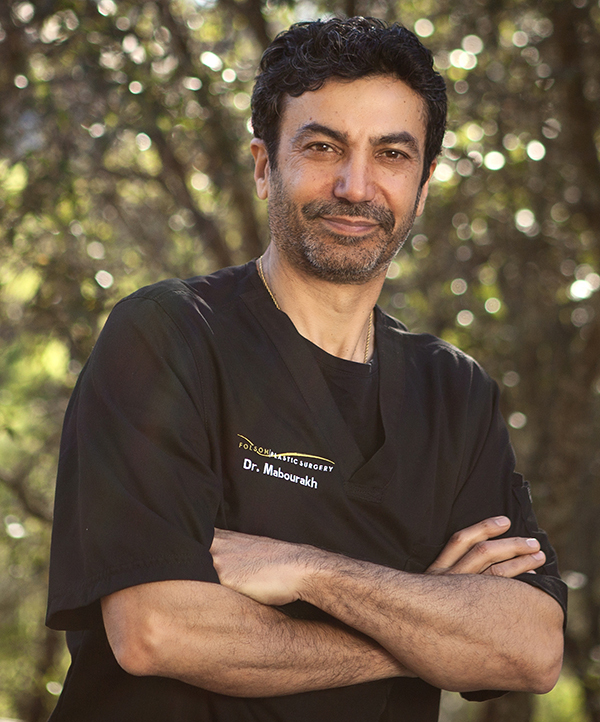 Dr. Mabourakh is board certified in general surgery as well as plastic, cosmetic and reconstructive surgery. What does F.A.C.S. Stand for after Dr. Mabourakh’s name? The letters f.a.c.s. (fellow of the american college of surgeons) after a surgeon’s name are a further indication of a physician’s qualifications. Surgeons who become fellows of the college have passed a comprehensive evaluation of their surgical training and skills; they also have demonstrated their commitment to high standards of ethical conduct. This evaluation is conducted according to national standards that were established to ensure that patients receive the best possible surgical care. For our patient’s safety, we use only board certified anesthesiologists. Most operations are performed in our fully accredited surgery suite in folsom, california. In some occasions such as accommodating a patient’s schedule and insurance we may use the folsom surgery center or mercy hospital of folsom and in stockton st. Joseph’s surgery center or medical center for in-patient procedures. These centers meet the highest standards of care. Some patients undergoing general anesthesia may require certain pre-operative testing. These lab tests are performed based on recommendations by the american society of anesthesiologists and are provided to you at no charge. Occasionally older patients, or those who may have serious underlying medical problems, may be required to have pre-operative clearance. Dr. Mabourakh will advise you accordingly during your consultation. Not as long as you would think. All procedures are performed on an outpatient basis, require no overnight stay and usually take only a few hours. You will have to arrive about an hour before surgery to check in with your surgical team and you’ll need to stay at least one hour after the operation to recover from the anesthesia. By then you’ll be back on your feet and ready to recover in your own bed or hotel room. During the procedure, our anesthesia staff insures that you’re comfortable and feel no pain since you’ll be asleep through the entire operation. Sometimes smaller operations may allow the use of local or intravenous anesthesia. This will be discussed with you in detail during the initial consultation with dr. Mabourakh. After surgery any pain or discomfort you may experience can be controlled through medication prescribed and will usually subside within a matter of days. It depends greatly on the procedure, but on average most patients are back to work within 2 to 7 days. Some larger or more complicated operations may require additional time away from work. Will everyone know I had surgery? Usually not, since good surgery enhances your looks naturally and it often goes unnoticed. Friends may ask if you’ve been on vacation, a new diet or exercise regime, but typically they won’t know you’ve had surgery unless you tell them. Procedures that focus on rejuvenation, such as facelift, forehead lift, eyelid surgery and laser skin resurfacing and tightening, can last from 5 to 15 years depending on the type of operation performed. Procedures that reshape or correct an imbalance, such as surgery of the nose, chin enhancement, breast augmentation, breast reduction and liposuction, usually offer permanent benefits that last a lifetime. This varies with the type of operation being performed. Generally there will be swelling and bruising for some time after surgery. Swelling will resolve slowly over weeks to several months, although most of it is gone in less than 30 days. Bruising is usually gone within a few weeks. The final optimal result can usually be appreciated a few months after surgery. Yes, but they probably won’t be noticeable. Dr. Mabourakh will make every effort to keep scars as minimal as possible and try to hide them in the natural lines and creases of your skin. For the majority of procedures your scars will fade over time and become barely noticeable. As with any operation there are certain risks. The most common risks include bleeding, infection and significant scarring. Although these events are usually infrequent, they sometimes can occur. Specific potential complications vary with each type of operation and these will be discussed with you during your consultation with dr. Mabourakh. In very rare instances hospitalization may be required. Less than you think. After years of being perceived as something only for the rich and famous, cosmetic surgery is now priced for everyone. People from all income brackets are undergoing surgery. In fact, half of the patients who undergo cosmetic surgery make less than $25,000 a year. Breakthroughs in medicine and outpatient surgery have brought the price of cosmetic surgery down considerably over the years, while the quality has gone up. Please keep in mind not all patients are alike and some will require a slightly different operation than others. You will receive a specific price quotation during your consultation visit. Some prices may vary depending on the complexity of the operation. Our staff is always happy to discuss these matters with you in more detail. We will make it easy for you to finance your surgery. We know people sometimes put off plastic surgery because of the cost. We don’t think you should have to do that, so we’ve created relationships with several leading finance organizations. These groups can provide cash to pay for all or part of your plastic surgery procedure. The monthly payments tend to be quite reasonable because interest rates currently are very low. During your consultation, our patient coordinator will work with you to determine which financing group best meets your needs. Usually we can help you obtain financing immediately during your office visit. Our fees are all inclusive. Your operation will include preoperative visits, lab tests such as complete blood count, electrolytes or pregnancy test, the surgeon’s and anesthesiology professional fees, the outpatient surgery center facility charges, implants (if applicable) and all of your post-operative care. Medications are not included and most often covered by insurance. Usually not, since cosmetic surgery is elective most insurance plans don’t cover it. But there are exceptions. Some functional surgical procedures may be covered by health insurance, in part or in full, depending upon your health insurance policy and the procedure you are having performed. If a “touch up” or adjustment operation is needed, will I be charged? Dr. Mabourakh will do his best to give you the results you desire. Unfortunately, no guarantee or warranty can be given. Occasionally, some patients may require a “touch up” operation. If this should occur there is usually no charge for Dr. Mabourakh’s professional services, but anesthesiology fees, surgery center facility charges, implants, and any other ancillary expenses are the responsibility of the patient.